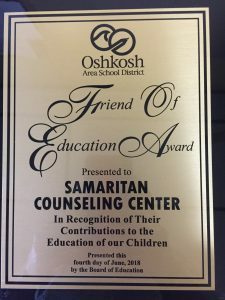 Oshkosh Area School District recently awarded Samaritan Counseling Center with the “Friend of Education” award recognizing individuals and corporations for their support and personal involvement of public schools. The award recognized Samaritan’s partnership within the District providing the inaugural 2017-18 emotional screening program Rise Up and their previous years of Wellness Screen. “With your assistance, we’ve been able to identify countless students who may have been struggling socially and/or emotionally and direct them toward appropriate services and supports…Without the service you provide, many of our students wouldn’t receive the mental health support they need…Your organization deserves to be recognized…,” Superintendent of Schools Stan Mack said in a letter. 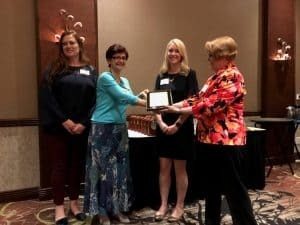 Samaritan’s Executive Director Rosangela Berbert (on the left) and Wellness Screen Program Director Jen Parsons (middle) accepted the award earlier this month. Without the Samaritan Counseling Center wellness screen team or founding and current partners, along with collaborating school districts, our work would not be possible. Thank you! If you would like become a a partner in providing this program to your students, or if you would like to donate to its cause please contact Wellness Screen Program Director Jen Parsons.